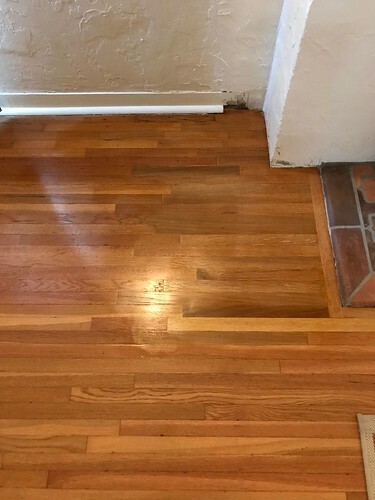 This is my first attempt at a hardwood floor repair so please, go easy on me! 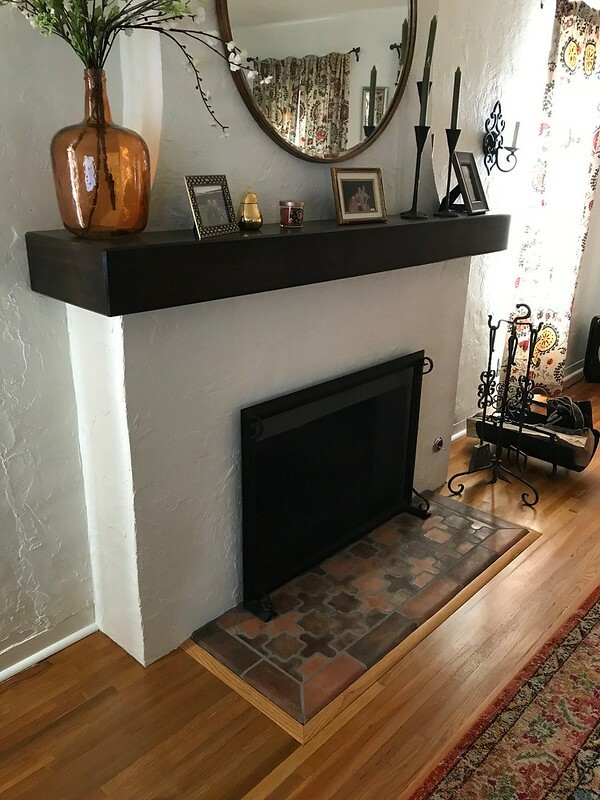 We recently refaced the fireplace and had a new hearth installed in our 1930 Spanish Colonial Revival. 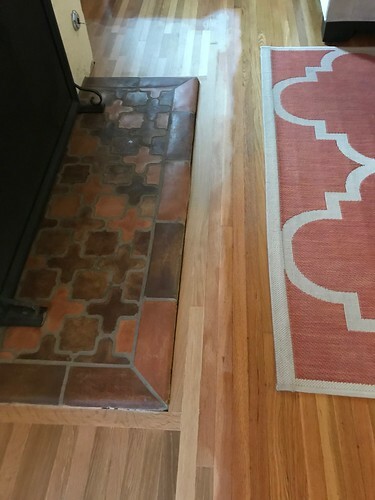 The job left a gap in the original white oak flooring approximately 3'x4' on either side of the hearth. I successfully feathered in boards to the existing 87 year old floor, got everything flat and troweled in some filler. I applied some Zinsser Bullseye Amber Shellac to match the color of the existing floor. What I did not take into account was the halo effect caused by the shellac being feathered onto the existing finish. I was planning on knocking down the shellac on the existing floor/finish with 220 then apply a coat of Defthane Semi Gloss Poly in an attempt to lessen the halo effect and match the sheen to the existing floor as the sheen of the shellac isn't quite the same as the existing floor. The instructions on both the shellac can and the poly can advise against applying the poly over the shellac. What are my other options in applying a clear semi gloss finish over the shellac to achieve my desired results? Once I get the floor sorted out, I'll need to extend the quarter round at the plaster boards and finish off the hearth with some molding. Many water-based poly-urethanes will stick to shellac. 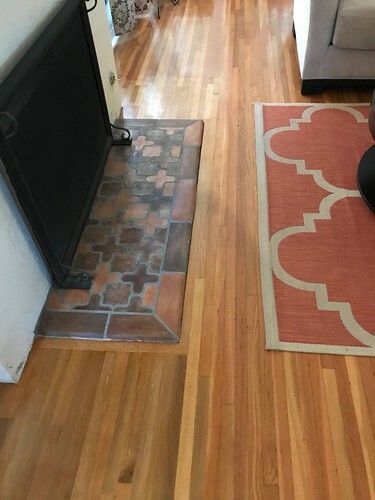 Once you get the floor finished you can find a sanded caulking that matches the grout color and use this as a filler between the hardwood floor and the tiles without any molding. 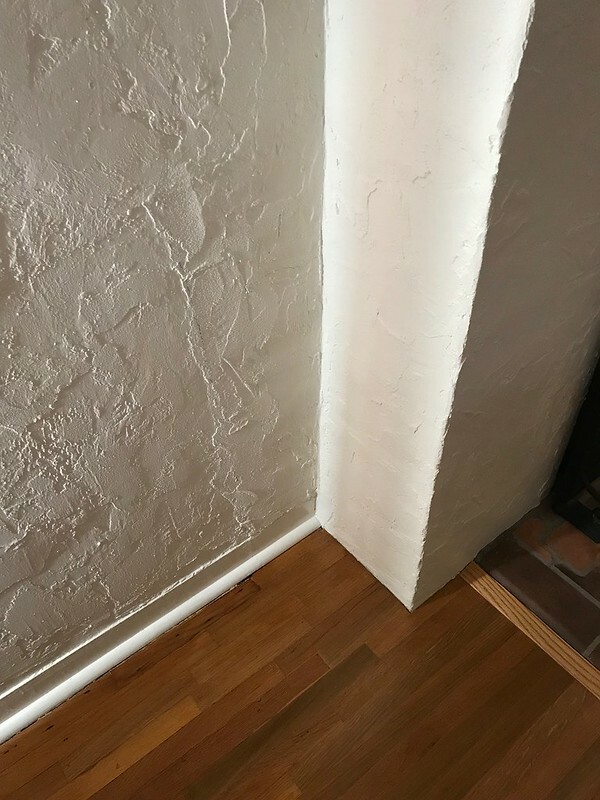 If there is a deep cavity where the two meet, use a foam backer rod to fill the gap, pressing it about an eighth to a quarter inch below the flooring before you apply the sanded caulk. Backer rod comes in quarter inch, three-eighths inch, etcetera, up to over an inch in thickness. You may use a foam packing rolled up to the right thickness that comes with new electronics to cushion during shipping, or even bubble wrap. The next challenge will be to get the details of the base and shoe right. Thank you for your response and compliment! What water based poly(s) have you had success using over shellac? Will there be any ill effects in feathering a water based poly over the existing oil based finish? 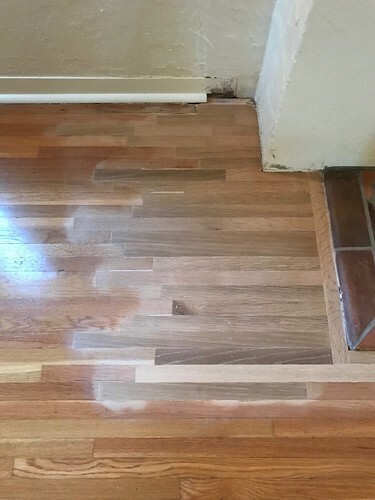 The floors were refinished about 15 years ago and oil based poly was used. FWIW, I took a couple of pieces of scrap that I used for shellac color samples and I coated them with Defthane Poly (oil) on Saturday and it seemed to adhere just fine; no blistering or aligatoring. I also did a pull test with some scotch tape and duct tape. Both did not lift the finish. I don't know if the warnings associated with poly over shellac are more long term, meaning issues arise down the road. I'm also wondering about the effect heat from the fireplace would have on the supposed non compatible finishes. As for the area around the hearth, the flooring is butted up to the hearth. 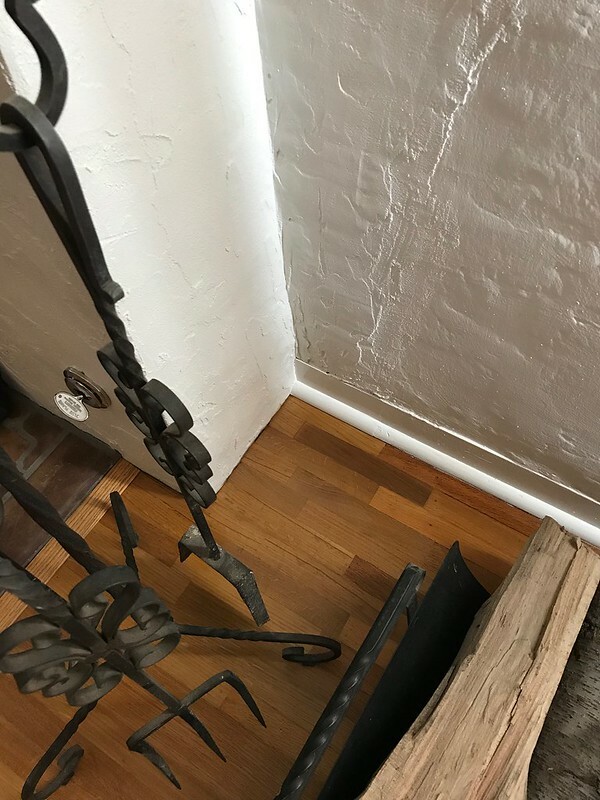 The problem is, the hearth is about 3/8" above the flooring. I think some molding would ease the transition a bit and finish it off. I'm not quite sure what I'll do about the base molding but the quarter round should be no problem at all. Making sure the floor is clean before coating is necessary to get adhesion. I have only used the Basic Coatings Tykote system to go over well cured oil based poly for whole rooms at a time. If the Defthane adheres well, I would go with that. If the finish is not adhering it will peal when it is stressed mechanically. It is a good idea to use a reducer strip next to tile to prevent the edges of the tile from chipping. I recommend keeping the wood reducer strip a little proud of the edge of the tile and making a slightly rounded eased edge on the reducer next to the tile. Reducer strips are made in 5/16th, one-half, and ¾ inch commonly. You will need to finish it before it gets cut and installed. You may need to shim the edge next to the tile to get the right height with tar paper, or I have used finish nails, before fastening it down. The sanded caulking will keep the joint from filling with debris. The eased edge will make the caulking application easier. 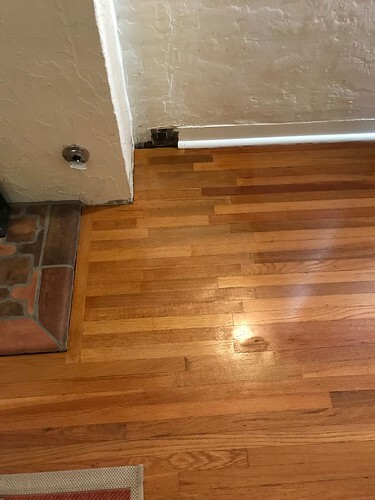 If you can find a flooring company that uses top-nailed oak flooring, which is 5/16ths inch thick, you could glue a piece up before the base shoe. Poly-urethane expanding foam would hold the thin piece of molding in place, but would be tricky to get just right. I would cut the shoe back a couple of inches so when you install the new piece of shoe, it will hold the short piece of new base board in place using a brad nailer, then fill the cavity with the foam. Install the shoe before the reducer strip. Thanks Pete. Can you please define "stressed mechanically" when referring the the Defthane adhering to the shellac? One example would be sliding a couch across the floor. The project is finished! I went ahead and applied the Defthane Semi Gloss Poly over the Bullseye Amber Shellac. There's no lifting yet, hopefully it will hold up for years to come. Pete, I took your advice on the base moulding and attached the shoe to my base extension first. That allowed me to properly align the bottom of the base extension flush with the existing base. I took an additional step and used a metal strap screwed to the base extension which lined up the top of the base flush. I used construction adhesive on the back of the base and shoe extension to install. I also took your advice and used a reducer strip to frame the hearth. I went with 3/8" x 1.25". 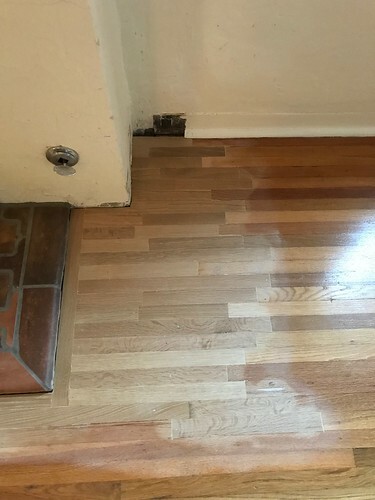 The sheen of the semi gloss doesn't perfectly match the existing floor sheen; the gloss was too shiny. At the end of the day, I'm pleased with the finished product. It's not perfect but a professional and I are probably the only ones that can point out the flaws. Thanks again for your advice!